Recently we drove, Favourite Wife And I, through the most astonishing, rugged, spectacular and – for us – unexplored country. 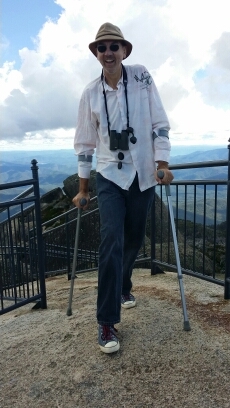 We were back in Mt Buffalo National Park, a favourite place not too far from Paradise. Our Park Ranger neighbour had said that there was more to see, and that we needed to push on past the idyllic Lake Catani. This is easier said than done, as the lake has it’s own irresistible gravitational field that drags you into its orbit of bird and reed rimmed, snow-country solitude. It has a melancholy beauty, a sense of age, a life so compound and complex that you feel minuscule; a fleeting visitor. There couldn’t possibly be people on top ……….. could there? But push on we did; on past bitumen’s end, Bugger and the rolling show strapped firmly in the back of our van. 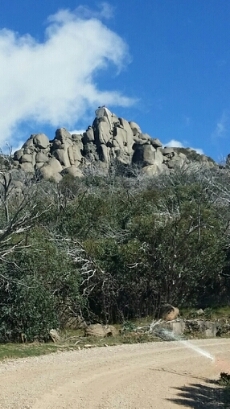 We drove through the perfectly named rock spires of Cathedral Saddle and onwards until in the distance we saw The Horn! And on the the very peak of this gargantuan pile of rock a tiny smudge of colour which looked, through binoculars on the bumpy road, like people! I didn’t mention this to Favourite Wife for several minutes because it seemed preposterous, and only more so as we gradually approached the rising pinnacle of The Horn. But they were people; and we urgently wanted to be amongst them! Here the story takes a bizarre turn, not so much because I climbed The Horn, but because I had little doubt that I could. The climb is about half an hour of steep track with frequent granite stairs that were cut into the stone during the 1940’s with the panache and precision of that era. I knew I could climb The Horn because twice every week I shorten my elbow crutches by one click (to the “off-road” setting) and head to the top of the steep hills opposite our home. This is bizarre. Two years ago I would not have dreamed of such a feat; and the hour and a half I spend walking the hill remains in irreconcilable contrast to my capacity at other times in the day. Where The Horn took a half hour or so to conquer, the climb to the top of our hills in Paradise took a good 8 months. It began last winter when my Favourite Wife brought home a Shooting Stick from the second hand store. I had been searching for one of these old fashioned devices which I remembered in the hands of my much loved spinster great-aunt. The theory that I wanted to test was that I could walk further if I could stop and sit down every now and then. With a seat, I reckoned, I could overcome the intimidation of the half way point: when you decide you have walked far enough, you still have to turn around and walk all the way home! But I have to look back in time to paint a full picture. Strangely enough it was the difficulty with typing which allowed me to begin to shake off the MND shadow. When dexterity (for want of a better word) began to trouble me I realised that the issue was not primarily one of strength; and with that knowledge I began to work on strength building exercise. I took advice from a friend who is a personal trainer. 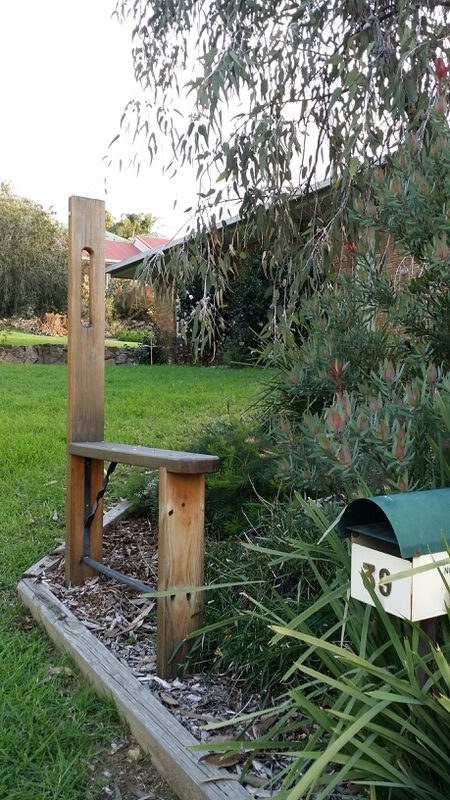 I built a seat at our letterbox as a half way rest stop. I built another seat, “The Outpost” over the road; and the bushland beyond the fence soon beckoned. Eventually armed with a cane in one hand and the Shooting Stick in the other, I climbed through the barbed wire fence and began incrementally longer forays in to the wilderness. What a joy! It took months from then on, pushing the distance a little at a time so that “enough” was reached no earlier than my return to our garage door. I was energised by reaching one goal after another, eventually setting my sights on a particular towering, twin-trunked gumtree high on the ridge. Two peculiar factors assist my climb: The first is that for several years I have found uneven ground far easier, ridiculously easier, to walk on than flat ground; so much so that crossing the bitumen road to begin the walk is often the most difficult stage. This also is bizarre – I know – but was explained by a therapist who said that uneven ground ‘recruits additional muscle groups’. The second is that I can breath freely while I walk, whereas sitting leads inevitably to the breathing machine. These two factors make walking on the hill very attractive! I reckon that it was on the day I reached The Big Tree that I finally shrugged of the MND gloom; completely (almost….) erasing it’s presence from my own thoughts and emotions. I can’t explain how difficult this was with any better metaphor than the steep hillside: eventually I climbed out. The climb is still daunting. But every time I reach The Big Tree and take in the panoramic views of our district I am exhilarated, and still astounded, by the bizarre freedom that awaits me on the slopes of Paradise. View from The Horn, not The Big Tree. It’s not bad either though. Good on you Rod,you are a champion ! Certainly something to rejoice about. Your fabulous determination throughout this period in your life is so inspiring. Its great to hear of leaps forward rather than back. Hi Rod you look great ! It’s always good to hear from you! When I read the bit about climbing and there being people on top of the horn I had a flash back to when I climbed Mt. Konobolos ( not sure of the spelling) at Jindabyne where I thought it would be peaceful and quiet and there at the top where 33 kids and a school teacher on a outing . Thanks for putting a smile on my face ,I am sure that you are being healed and your writings are showing your faithfulness to God . Great read as always Rod….. So happy for you being able to conquer that hill!!!!!!!!!!! I read this post a few weeks back and meant to comment then sorry. Wonderful news to hear that you’re making such incredible progress. I pray that you continue to move forward and you are fully restored. You are an inspiration, Rod. I’m reminded of the Scripture in Habbakuk 3:18-19 where it speaks about God giving us feet like hinds feet so that we can walk on the heights. God bless.